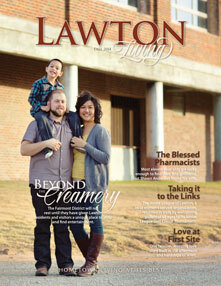 We are excited to showcase this spring issue’s special section encompassing Faces of Lawton. Whether they are entrepreneurs, directors, or support staff, they are a vital part of our local economy’s success. We hope you enjoy looking at these professionals’ lives in and out of work, as much as we relished putting this segment together for you, our readers. On a personal note, we are excited to announce our newest addition to the Martin family, Guy David, born this past November. Have your photographer share a picture of your bundle of joy with us today. Email Tabitha at content@ hometown-living.com. We would love to showcase them in a Hometown Bundles special section. Do you WANT A SUBSCRIPTION? Send an email to subscriptions@hometown-living. com and put LLM in the subject line to be added to our digital subscription list which will alert you to view magazines online at www.hometown-living.com. We want to thank our advertisers. Let them know you saw their ad in this issue! I know we are all ready for spring! And thankfully it is on the way. With wedding season in mind we thought a beautiful bride, and her groom of course, was just the thing for this issue’s cover. Please contact us to share your engagement, wedding, or milestone anniversary with us! 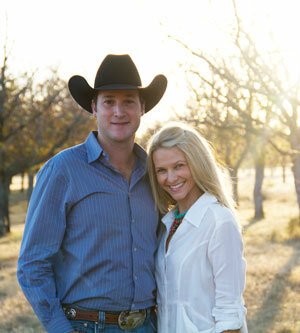 We would love to help you celebrate with an announcement in Lawton Living Magazine. Contact our new Content Coordinator, Zenah Valle at content@hometownliving. com. As always we want to hear from you – this is your HOMETOWN publication – let these pages reflect your life here by sharing your human interest article ideas with us, as well as, events for consideration in the Hometown Happenings section. Do you WANT A SUBSCRIPTION? 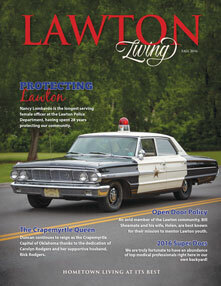 Send an email to subscriptions@ hometown-living.com and put Lawton in the subject line to be added to our digital subscription list which will alert you to view magazines online at www. hometown-living.com. We want to thank our advertisers. Let them know you saw their ad in this issue! There is no better way to show HOMETOWN LIVING AT ITS BEST than to spend your hard earned money here in your hometown. Check out the Index of Advertisers list (located at the back of the magazine) and start shopping! With school back in session our family is getting in the swing of things. One thing that I most welcome about this time of year is football! We were excited to feature Coach Mike Burris from Eisenhower and we wish the Eagles well this fall, as well as, The Highlanders & Wolverines! Fall also brings holidays! You either anticipate them or dread them...I for one look forward to them every year; so this Christmas season we encourage you to shop local! Take a look at the many hometown businesses and spend your money here. Check out the Women in Business special section this issue and read these local ladies’ stories – from yogurt shop to boutique owners there are a variety of goods to choose from here at home in Lawton. Speaking of professionals…check out the article submitted by YPL and get involved in this group today. They are leaving Lawton better than they found it by giving back to the community where they work and play! Check out this edition’s Super Docs; showcasing the many qualified physicians and medical professions in the area. Their specialties vary, but their attention to caring for you – the patient does not. So don’t put off what ails you any longer and scroll through this list to find a doctor near you that’s right for you. If you are new to town use this as a guide to help acclimate yourself to Lawton and keep your care local. 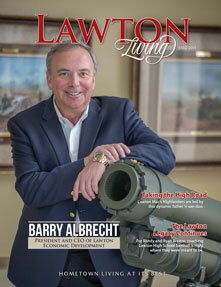 As always thank you for reading Lawton Living Magazine! We appreciate you! And we thank our advertisers for their participation which brings this coffee table publication to readers free of charge. So please shop here first and tell them you saw their ad in Lawton Living today! There are so many things going on around town this season. 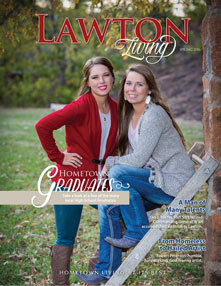 With graduation nearing us, Lawton Living Magazine is proud to feature a few of the many local graduates to cross the stage this May. Share a picture of your favorite scholar with us for consideration in upcoming issues. My oldest child, Gatlyn (5), is graduating from pre-k moving on to kindergarten next fall. My niece, Shyann, will be graduating from Angelo State University this May as well. Two major milestones, both could bring tears to my eyes, but regardless it is an exciting season. We congratulate all the graduates in your family! Spring always produces change and growth; be it within your family or the world around us. Just take a look at this issue’s cover, and consider taking a trip to nearby Wichita Mountains Wildlife Refuge to experience almost 60,000 acres of Oklahoma landscapes! We love to hear from you! Tell us what you love and what you would like to see more of in future issues. As always we want to feature your events and uplifting stories about the great things and people around town. Check out our Hometown Contributors page – showcasing profiles of those who help make Lawton Living possible. If you are interested in joining the freelance team, give us a call at the office or email Tabitha for more details. We are always looking for writers and photographers at all levels. To pick up your complimentary copy go by any advertiser location listed in the back of the magazine in the Index of Advertisers. Let them know you saw their ad here in Lawton Living. 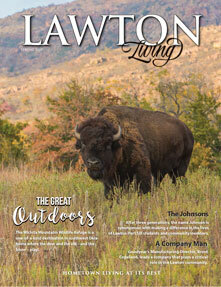 As always we thank you for reading Lawton Living – showcasing Hometown Living At Its Best. Some people are fanatics about New Year’s resolutions….I am not. But I do always try to make ‘Back to School’ resolutions which include getting into a healthy routine…. regular bed times, dinner together as a family at the table, and trying to actually cook that dinner instead of picking it up. Heck, I may even try working out this fall (that should last until at least Thanksgiving). But one thing required to get kids back into school is shot records; with this in mind a good resolution for us all would be not to neglect our preventative health care. This issue is the first ever to feature Super Docs, an exclusive section showcasing the many qualified physicians in our town. Their specialties vary, but their attention to caring for you, the patient, does not. So don’t put off what ails you any longer and scroll through this list to find a doctor near you that’s right for you. If you are new to town use this as a guide to help acclimate yourself to Lawton and keep your care local. 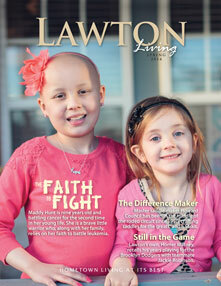 As always, we thank you for reading Lawton Living. We strive to show you the many people, places, and things that highlight the numerous positive attributes Lawton and the Duncan area have to offer! Happy Fall Y’all! We love profiling our talented and diverse neighbors with you! There is so much the Lord is doing in our neighborhood and we are grateful to be able to share their testimonies. A few of the many stories in this edition include ‘A Man of Many Talents’ featuring Retired Army Major General Lee Baxter, which was written by family friend, Amy Ewing-Holmstrom. If you have a human interest story idea, we want to hear about it! Email Crystal your ideas, events from your many organizations (Hometown Happenings), pictures to announce newborn babies (Hometown Bundles of Joy), weddings (Hometown Wedded Bliss), or anniversaries. We feel so blessed here at With You In Mind Publications and we thank God for His many blessings to our business, community, and state. Read how He is working in the lives of your neighbors. “For it is God who works in you to will and to act in order to fulfill His good purpose” (Philippians 4:13). Remember He has a plan for you too! If you would like your event or club featured email Content Coordinator, Crystal, for submission details or questions. Check out the NEW AD PRICES for our WEDDED BLISS section. 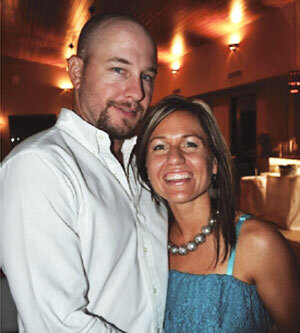 Contact us for information on submitting your wedding announcements (Ask about DISCOUNTS). WYIM is growing and we continue to be on the SEARCH for writers and photographers (beginners and seasoned). Call our office or email Matt to learn how you can get involved in future publications! ‘LIKE’ us on Facebook at: With You In Mind Publications for updates. We have also posted a correction from the last issue concerning the Lawton Ballet Theatre’s production of The Nutcracker. Check it out! 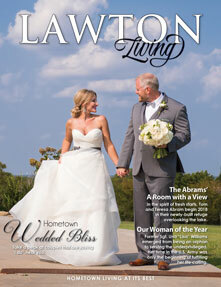 Do you WANT A SUBSCRIPTION to Lawton Living Magazine? 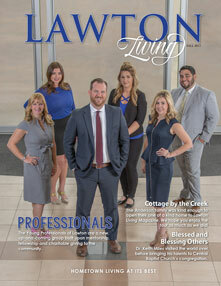 Email our talented Office Manager, Kati, and let her know you want on the LAWTON digital subscription list which will alert you to view the latest issue online before the print copy hits the streets. ‘LIKE’ us on Facebook at: With You In Mind Publications for additional updates on all our Texas and Oklahoma Magazines. We want to thank our advertisers as always for their participation which keeps LLM coming to you FREE of charge! There is no better way to show HOMETOWN LIVING AT ITS BEST, than to spend your hard earned money here in your hometown. Check out the Index of Advertisers list (located at the back of the magazine)! It’s finally FALL, y’all! Lawton is busy thinking football, back to school, & holidays. We all agree summer is a blast, but there is nothing like getting back into a routine and starting to ponder cooler weather and holiday fun just around the corner. Check out the LOCAL SHOPS advertising within these pages and get a head start on your Christmas list! There is no better way to show HOMETOWN LIVING AT ITS BEST, than to spend your hard earned money here in your hometown . Check out page 143 for an Index of Advertisers list! Lawton residents have pride in their past, but are striving to improve their future both by actions and preservation. You will read several articles about devoted people working hard to renovate, preserve, and rejuvenate. Help in this effort in whatever small way you can as an individual; from updating your front garden to attending fund raisers and events promoting other’s endeavors. Show you care and start in your own backyard! This will exemplify HOMETOWN LIVING AT ITS BEST! We want to thank our advertisers; mention that you saw their ad in this publication! Their participation allows LLM to come FREE of charge to you! Check them out in the Index of Advertisers (page 143) and go by to get your copy today. Also, view our magazines online at www.hometown-living.com & ‘LIKE’ us on Facebook at: With You In Mind Publications for additional updates on all our Texas and Oklahoma markets. Our family has been in the publication business over 30 years and we are very excited to bring a magazine that personifies “hometown living at its best” to you. 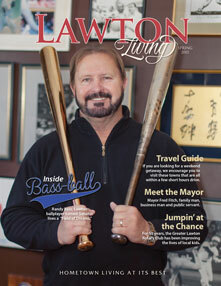 Lawton Living Magazine is a semi-annual publication dedicated to the people,places, and things that make Lawton such a wonderful place to live. Each issue is complimentary to the public thanks to all of the local advertisers. Please go by any of their locations to pick your copy up today (see Index of Advertisers in the back)and support them by shopping local. Whether you are new in town or never left, we hope you are able to learn something you did not already know about this great city. View our magazines online at www.hometown-living.com & ‘LIKE’ us on Facebook at: With You In Mind Publications for additional updates on Lawton Living and our Texas markets. 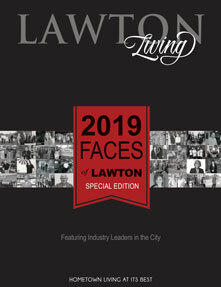 All of us at With You In Mind Publications continue to look forward to a long relationship with this area and many more issues of Lawton Living to come!